Jane Cassidy creates site-specific audio-visual installations. By manipulating various technologies such as speakers and projectors, Cassidy fuses light and sound to form meditative environments filled with visual music. 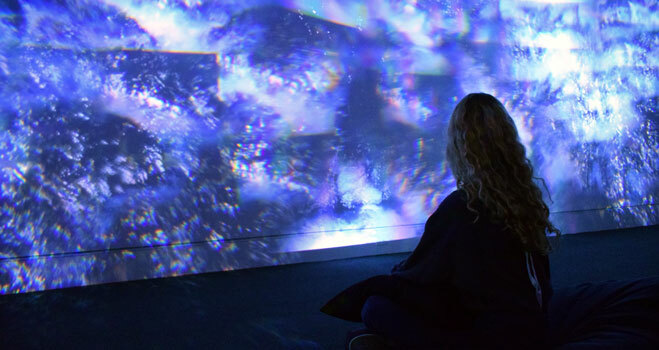 At the Mobile Museum of Art, she will exhibit a contemplative installation melding sound and illumination, a fully immersive environment of projected light and music that resonates in the body and mind of the viewer. An Irish artist currently living and working in Tuscaloosa, Alabama, Cassidy trained in music composition and animation. She earned a Masters in Music and Media Technologies from Trinity College Dublin in 2008 and a Masters of Fine Arts in Digital Art from Tulane University, New Orleans, Louisiana in 2014. Since that time, national and international film festivals, galleries, and museums have featured her work.